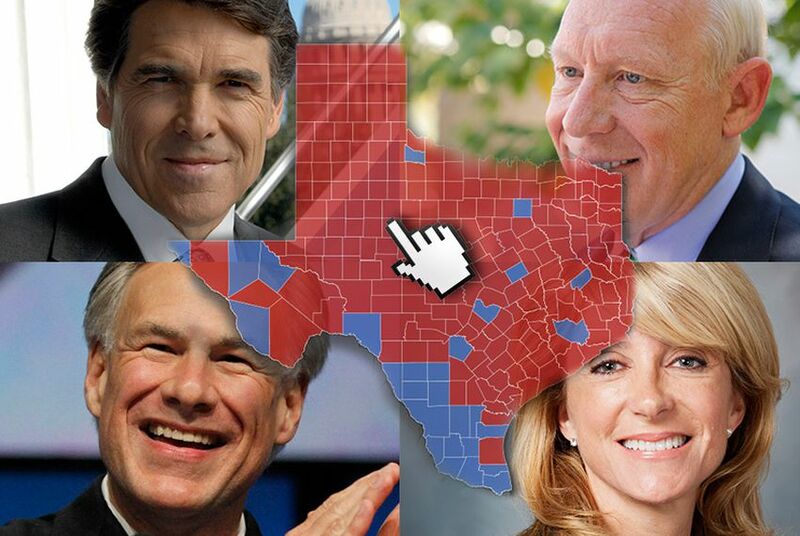 Use our interactive maps to compare which Texas counties went red and which went blue in the 2010 and 2014 Texas governor's races. In order to have a shot at victory in the Texas governor's race, Democrat Wendy Davis needed to pick off counties that went Republican in 2010. As you can see from the maps below — which compare the Texas counties that went red and blue in both the 2010 and 2014 Texas governor's races — that was a losing proposition. In fact, she lost ground. The 2010 race between Republican Rick Perry and Democrat Bill White marked the best performance by a Democrat since 1994 — even though White won only 28 counties and amassed just 42.3 percent of the overall vote. Perry got just under 55 percent, coasting to a third full term in office. The top map shows the unofficial results from Tuesday's general election for governor, with red representing counties won by Republican Greg Abbott and blue representing the counties where Davis prevailed. Davis got just 39 percent of the vote — and 10 fewer counties went Democratic in 2014 than in 2010. Davis lost the following counties that White won: Bexar, Brooks, Culberson, Falls, Foard, Harris, Kleberg, La Salle, Reeves and Trinity.